Perfect for use in gallon jugs and growlers. Rack your finished beer into this bucket with a spigot (sold separately) to facilitate the bottling process. Holds up to 6.5 gallons. Rack your wine or beer into this 7.9 gallon bucket with spigot (sold separately) to facilitate the bottling process. This rinser has a manually-operated self-priming pump that will spray a stream of sanitizer or cleaner from the reservoir up into a bottle when pushing the bottle down into the nozzle. Makes quick work out of sanitizing bottles. This filler is easily primed, self-leveling and automatically shuts off preventing overflows. 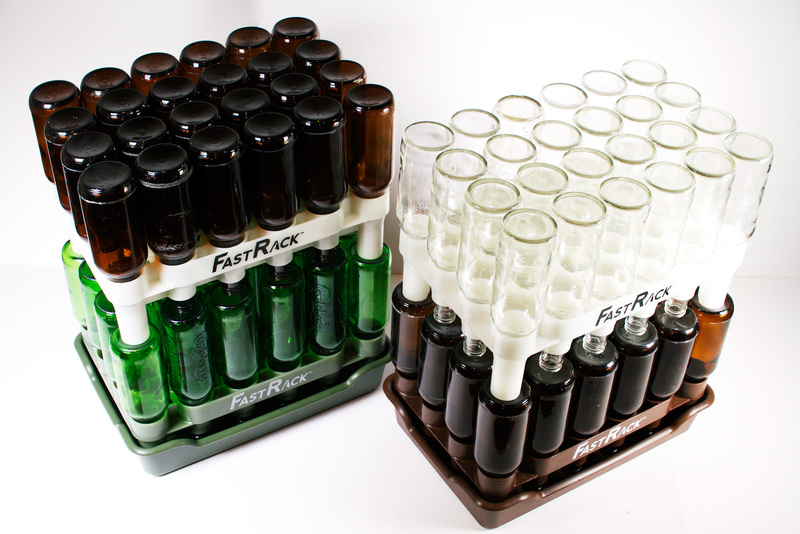 The Fastrack stack & store system makes storing empty beer bottles easier and more sanitary than ever before. Made form heavy-duty plastic, ailment racks of 24 bottles can be stack on one another to save space, and the tray (sold separately) can be placed underneath to contain any drips of rinse water or sanitizer. Price is for one rack. 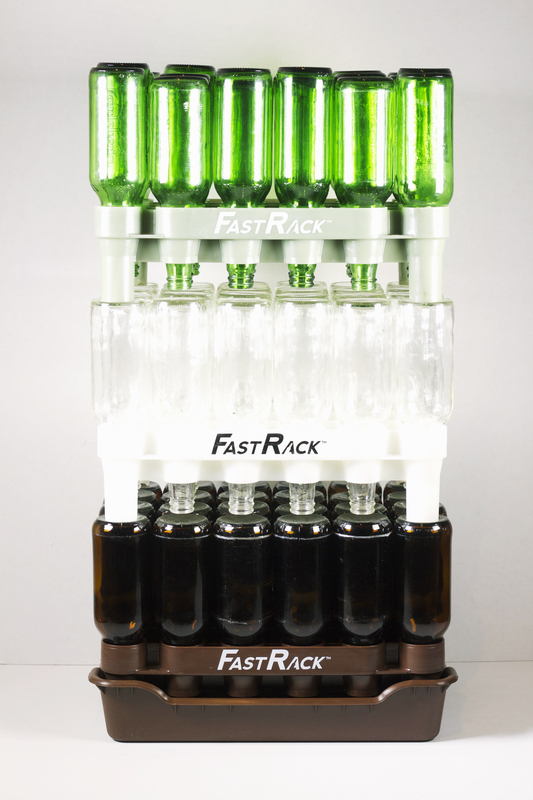 The Fastrack stack & store system makes storing empty wine bottles easier and more sanitary than ever before. Made form heavy-duty plastic, and the tray (sold separately) can be placed underneath to contain any drips of rinse water or sanitizer. Price is for one rack. 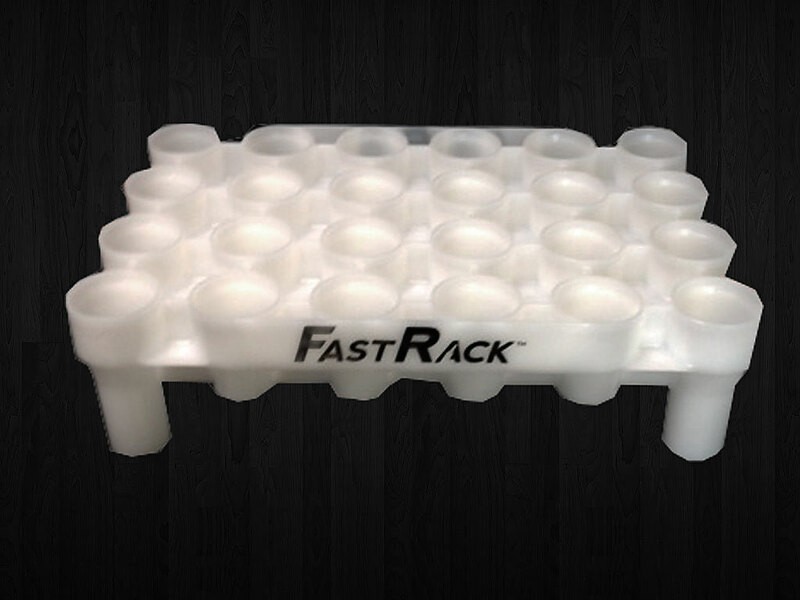 Designed to be used with the Fastrack stack and store rack, this heavy-duty plastic tray will contain any drips from rinse water or sanitizer. Designed to be used with the Fastrack stack and store rack for wine bottles, this heavy-duty plastic tray will contain any drips from rinse water or sanitizer. 15" length; springless; easy fill mechanism. Packaged with a poly bag, header and instruction sheet. This slick unit can be used for bottling both still and sparkling wine. The filler has a tapered fitting that accommodates 5/16", simply attach the siphon hose to the spigot on the bottling bucket and filler unit, turn the spigot on, push the button on the filler and the filling begins! When the bottle is full, the unit automatically shuts off. The rubber piece that goes into the bottle can be moved to adjust the fill level. The nut on the top of the unit allows regulation of the flow. Tapered stem to fit both 5/16" and 3/8" siphon hose. With nut and two washers. Fits the 6.5 gal. and 7.9 gal. pre-drilled buckets. Replacement Gasket for Italian Bottling Spigot.